Named after the fruit trees William Pabor envisioned when he founded the town in 1884, Fruita now thrives in its historic role as an agricultural and business center. Winner of the Governor’s Smart Growth and Development Award for four consecutive years, the city’s charming “hometown” character and extraordinary quality of life are sure to captivate you. Located in Mesa county, off Interstate 70 at exit 19, Fruita is energized by the Colorado River and its breathtaking surroundings, highlighted by the Colorado National Monument. From its diverse economic base and world-class sports and leisure activities to its bountiful fields of agricultural crops, Fruita’s offerings are abundant. Mission: Growing our community one business at a time by cultivating creative and successful partnerships. 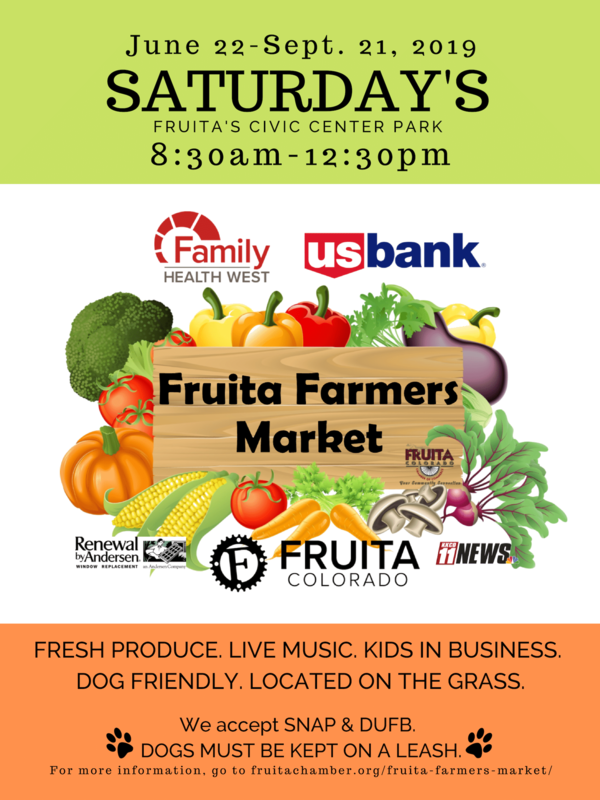 For more information on this year’s Fruita Farmers Market & Vendor Opportunities, click here! Thank you to our Community Connection Partners!